New management to AIME, Talk2 Media & Events, has reviewed multiple facets of buyer needs, exhibitor requirements and registration procedures, and has new initiatives to ensure a smooth, robust process. “Hosted buyers, both quantity and quality, together with geographic spread are core to underpinning the future success of AIME. We have invested heavily into the Hosted Buyer Program and it’s pleasing to receive strong early interest from buyers in Asia-Pac and Australia alike.” commented Talk2 Media & Events Director Matt Pearce. All buyer expressions of interest are vetted for professional suitability before being invited to register for the Hosted Buyer Program. Registration details cover experience, annual event budgets, purchasing authority, and their event portfolio over the next five years. With up to four reference checks, this comprehensive assessment of applicants ensures the right buyers will be at AIME in 2019. The purpose of AIME is connecting the interested buyers with the right exhibitors. To improve this process, Talk2 Media & Events conducted a thorough audit of event planning software and have appointed Centium as the supplier of the meetings scheduling software. Able to manage simultaneous and complex scheduling, AIME 2019 expects to deliver over 14,000 business meetings through the GDPR compliant EventsAIR software, with every hosted buyer allocated 32 well matched, pre-scheduled appointments (PSAs) across two event days. Time is valuable and committing to the entire three-day event isn’t always practical, so in 2019 there will be a range of options for participation at AIME. Immersing in the entire event, buyers can attend through the Hosted Buyer Program or flexible packages over one, two or three days are available as a Pre-Registered Trade Buyer. 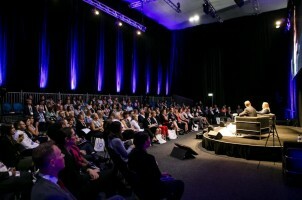 “The business events industry is a unique and diverse pool of people. By creating a flexible program, we are offering all buyers the opportunity to attend the event at a level that suits their availability and objectives. Being fully engaged in the whole program, or just having a taste of the event, buyers can find those serendipitous moments. Our new offer is the fruit of countless conversations with various stakeholders over the past months.” explained AIME Event Director Jay Martens. AIME is the platform when global exhibitors meet with a diverse pool of buyers from Australia, New Zealand, and Asia Pacific, as well as buyers from the Middle East, Europe and the Americas. Buyer destination and interest is aligned against exhibitor services and capabilities, guaranteeing that everyone’s time is worthwhile. For more details and to submit your interest to attend AIME in 2019 visit aime.com.au. Αναρτήθηκε από geop στις 6:07 π.μ.